The chakra is an active principle vibrating at a definite frequency. It can be compared to an energy vortex that put into interaction the body (organs, nervous plexus and different apparatus such as neuro-muscular, circulatoiry, respiratory and hormonal systems) as well as psychic centers with electromagnetic fields from all sorts of external sources (human, objects and elements). They are thus as well physiological centers as psychic vortex. In each human being exists a great quantity of chakras, but only the major ones are used for the practice of Tantra and Yoga. According to the esoteric standard tradition, seven chakras can be itemized. according to some others traditions, only five chakras are to be found, Swadhisthana Chakra and Sahasrara Chakra are not mentioned. The last one is not considered as a chakra even though it is classified as. It stands for the peak of ascent and the climax of unconditioned infinite consciousness. 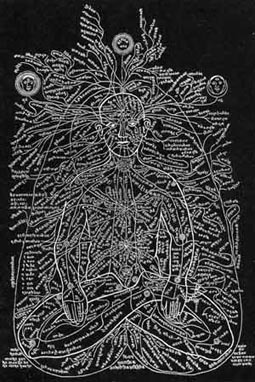 in the pranic healing, the art of healing by controlling the prana, a broader array of chakras can be found with hierarchies of major and minor vortex (spleen, kidneys and so on). in kundalini yoga, an eighth major chakra can be found. CHAKRAS 1ST Level, the simple yantras lotus, their colors, simple yantras, their colors.